Today the temperature with the heat index is 105 degrees. I’ve barely made it outside today, not even to hit the swimming pool or take my dogs to swim. It’s just unbearable. However, I did have to take my dogs for a walk and after they ate dinner we took a stroll around our subdivision. By the time we got back both dogs found an air conditioning vent and plopped right down onto it. I on the other hand wanted something cool and refreshing. Since everyone in my house this evening was out doing various things I decided instead of making dinner for myself I’d make a smoothie. Looking to see what I had in my refrigerator, freezer and fruit bowl I decided to take a banana, some frozen mangoes from my freezer along with about a cup of orange juice. I put all that in my favorite VitaMix blender and made a luscious beverage for myself. Smoothies are so wonderful if you’ve never taken the time to make one. Just select your favorite fruits, add some OJ, apple juice, yogurt or whatever else sounds good, maybe even that heart healthy POM juice. Whip it up and it’s a filling and delicious treat. You can’t go wrong especially if they are all ingredients that you like. So if you’re looking for something to cool you off, try a smoothie. I know I’m glad I did this evening. That looks really tasty, as I said before, I love Mango! Ummm Mango! When I think smoothie, I think strawberry/banana. Now I can be less boring and add mango! Oh – and I tred the Pom juice on your recommendation – I liked it! 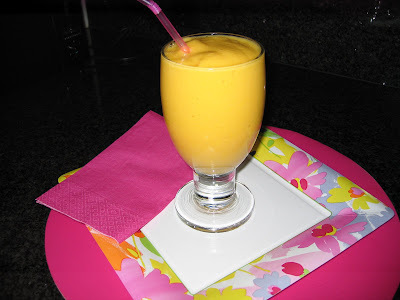 Vicki – do you need to add ice to the smoothie? What proportions of fruit to liquid do you use? I have an overabundance of fruit right now and I’m sure the extra would make a fantastic smoothie! Honestly I never measure and I don’t believe you can go wrong with whatever or how much you add. Add the amount that you think you would like. For instance if you like strawberry/banana I would add one banana and maybe a 1 1/2 cups strawberries then add whatever juice you like. I always use cranberry blend to mine like that or apple juice. Experiment, with the ingredients and amounts until you get it how you like. Be creative, you can’t go wrong. You can even add yogurt. Hope that helps.